GRAPH-HEX® product was developed through our expertise in the early 2000’s as an economical source of high quality recarburizers for the foundry and steel industries. Utilizing our world wide sourcing of the highest quality raw materials combined with state-of-the-art manufacturing facilities, and quality control enables our customers to receive the most economical high quality carbon additive in the market. Larpen Metallurgical Service produces low to medium sulfur petroleum cokes ranging in sulfur from 0.5% – 4.0%. 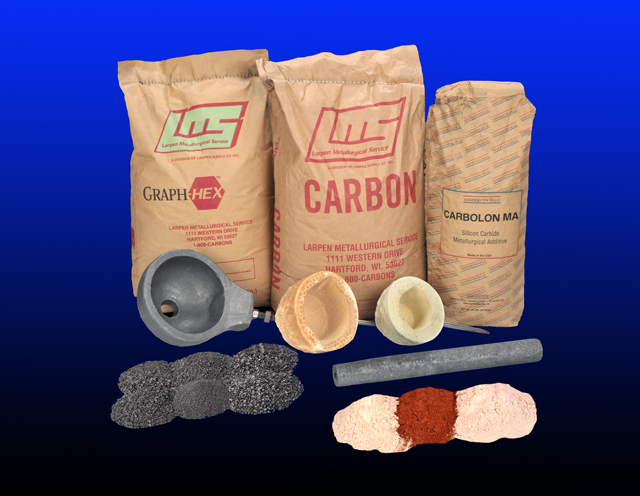 These products are used as a charge carbon for gray iron casting. Larpen Metallurgical Service is a distributor of Carbolon MA 90% silicon carbide from Washington Mills.